LOS ANGELES (TICKER) -- James Blake thrived and then was lucky to have survived. Blake fought off a match point before winning the final three games in a 6-0, 1-6, 7-5 victory over fellow American Paul Goldstein in the second round of the $525,000 Countrywide Classic on Thursday. The No. 2 seed, Blake tore through Goldstein in just 23 minutes in the opening set, only to see Goldstein surge back in the middle set. Leading, 5-4, in the deciding set, the 97th-ranked Goldstein was on the verge of a huge upset, taking a 40-30 lead on Blake's serve. Blake battled back to tie it, then broke Goldstein in the 11th game before serving out the match. Blake, who is ranked ninth in the world, earned a spot in the quarterfinals against countryman Vincent Spadea, who ousted No. 5 seed Dmitry Tursunov of Russia, 6-7 (5-7), 7-5, 6-3. Spadea, who celebrated his 33rd birthday on Thursday, advanced to a quarterfinal for the seventh time this season. In other second-round matches, American Zack Fleishman upended compatriot Robert Kendrick, 7-6 (7-4), 6-3, to earn his first career ATP quarterfinal. Fleishman had shocked top seed Fernando Gonzalez of Chile, 7-6 (7-5), 6-4), in the first round. 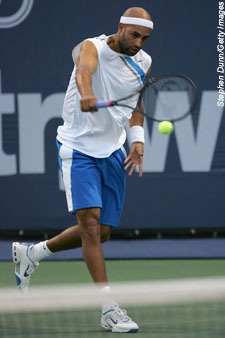 He looks to continue his surprising run against Czech Radek Stepanek, who ousted sixth-seeded American Marty Fish, 6-2, 6-2, in a second-round match Thursday. Third-ranked Marat Safin already advanced to the quarterfinals by outlasting Switzerland's George Bastl, 6-2, 2-6, 6-4, in two hours Wednesday night. Safin will face No. 7 Hyung-Taik Lee of Korea in the quarterfinals. The other quarterfinal is an all-German matchup between unseeded Nicolas Kiefer and Michael Berrer. The tournament's defending champion, Germany's Tommy Haas is not entered in this event. He is recovering from a torn abdominal muscle sustained during Wimbledon.